Anjum is a cookbook author and food entrepreneur. 1. Start by making the coriander chutney. Put all the ingredients and 3 tbsp cold water in a mini processor and blend together until very smooth and creamy, adding a little more water if necessary. Season, adding more lemon juice to taste. Keep in a glass jar in the fridge until needed (for a maximum of 3 days). 2. Butter one side of each slice of bread. Turn them over and spread one with a little more butter. Layer over the cheese, rocket, tomatoes, red onion and capers. 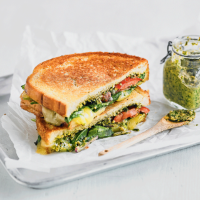 Spread the coriander chutney on the other slice of bread and top the sandwich, chutney-side down. 3. Warm a heavy-based frying pan over a medium heat. Place the sandwich butter side down in the pan and cook, pressing down gently, for 4 minutes or until golden. Reduce the heat if necessary. Flip over and repeat on the underside until golden and crisp and gooey on the inside. Serve immediately with extra chutney on the side.